One of our core product line, where we became famous with. Our ProX Connecting Rod Kits are made out of the toughest alloys available today and are made in Japan! O.E.M specifications and tolerances are meticulously maintained, a guarantee for easy installation and trouble free performance. Find our connecting rod dimension overview here. Manufactured by leading Japanese OEM factories. Designed to exact OEM specifications to be a direct and cost efficient OEM replacement. Complete line for Dirtbike, ATV, PWC and 50cc/scooter available from stock. This process maintains superior strength, durability and dimensional consistency through improved grain flow. The design of a connecting rod is very important to guarantee the lifespan and the performance. Our connecting rods are barrelled and shot peened to improve the surface texture. Shot peening eliminates residual stress and smoothly blends the forging surfaces. Our ProX oiling slots are precisely located to maximize lower rod oiling and extend bearing life. Even under the most extreme conditions the rod will do its job. 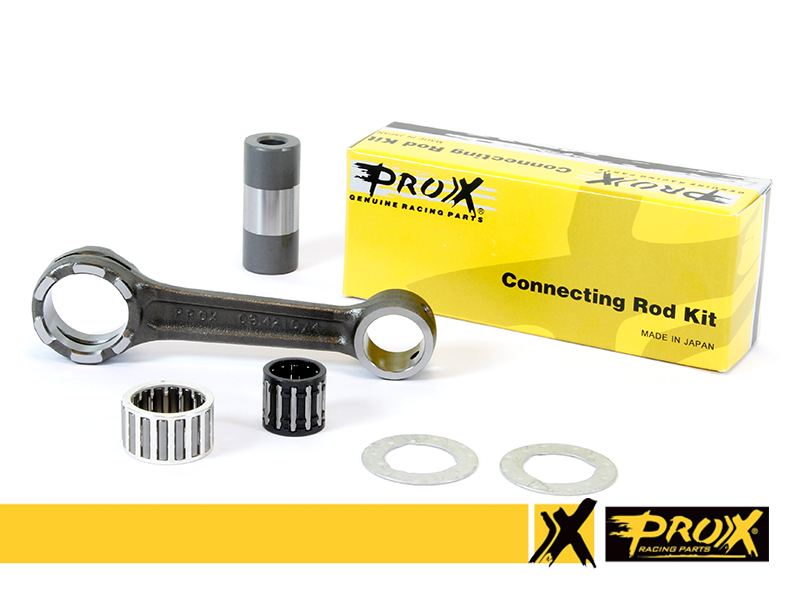 ProX Connecting Rod Kits come complete with Crankpin, Big-End Bearing, Small End Bearing and Washers. ProX Brake Pads: New material, new packaging, same pricing! Shaun Simpson and Arnaud Tonus on our booth, EICMA!